Silverpond is hosting the Deep Learning Workshop on the 5th and 6th December this year. The aim of the workshop is to take attendees with a basic python skills and a keen attitude and equip them with the tools to develop Deep Learning models in TensorFlow. This time, Silverpond has a scholarship, valued at $1,300, available for one deserving person to attend both days of the workshop. 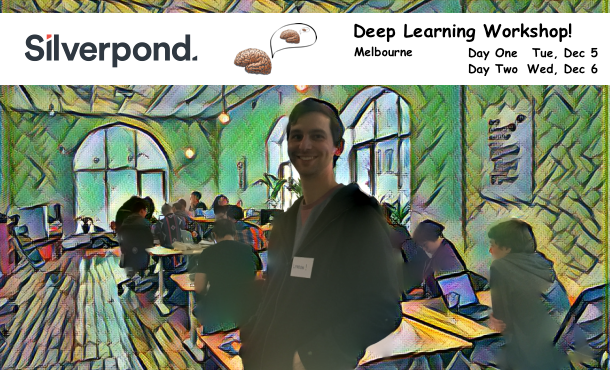 We are looking for a individual keen to develop their Deep Learning skills that may not otherwise be able to afford to attend. We would like to hear about your background, and why attending the workshop would be valuable for you. The scholarship is open to everyone, and we encourage all to apply. The winner will be chosen by the Silverpond Judging panel by 2nd November 2017 and notified the following day. The Judging panel’s decision is final. To apply, please fill out the following form: Silverpond’s Deep Learning Workshop Scholarship. If you have any questions or queries please do not hesitate to reach out to us via training@silverpond.com.au, and also, early bird tickets for the workshop are still available, so you can grab one now to secure your place!